In medium bowl, beat eggs, sugar, vanilla and salt with wire whisk or fork. Gradually stir in milk. Pour into six 6-ounce custard cups. Sprinkle with nutmeg. Place cups in 13x9-inch pan on oven rack. Pour very hot water into pan to within 1/2 inch of tops of cups (see box, below). Bake about 45 minutes or until knife inserted halfway between center and edge comes out clean. Remove cups from water. Cool about 30 minutes. Unmold and serve warm, or refrigerate and unmold before serving. Store covered in refrigerator. Before making custard, in heavy 1-quart saucepan, heat 1/2 cup sugar over low heat 10 to 15 minutes, stirring constantly with wooden spoon, until sugar is melted and golden brown (sugar becomes very hot and could melt a plastic spoon). Immediately divide syrup among six 6-ounce custard cups before it hardens in saucepan; carefully tilt cups to coat bottoms (syrup will be extremely hot). Let syrup harden in cups about 10 minutes. Make custard as directed in Step 2; pour over syrup in cups. Bake as directed in Steps 3 and 4. Cool completely; cover and refrigerate until serving or up to 48 hours. To unmold, carefully loosen side of custard with knife or small spatula. Place dessert dish on top of cup and, holding tightly, turn dish and cup upside down. Shake cup gently to loosen custard. Caramel syrup will drizzle over custard, forming a sauce. Why is custard or crème brûlée baked in a pan of water? 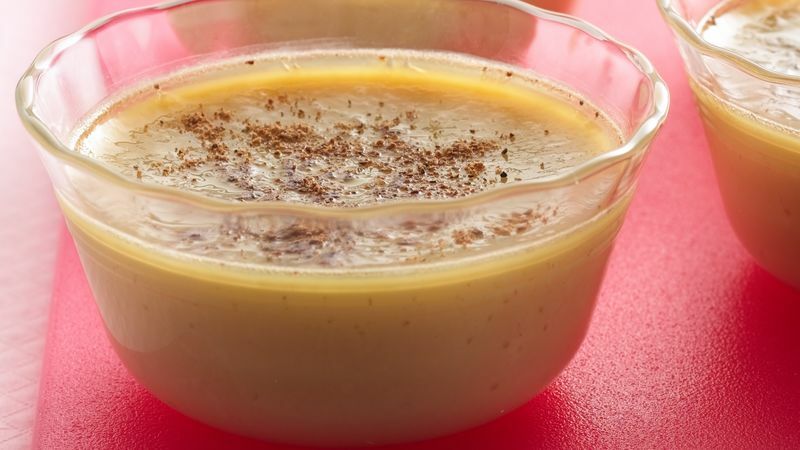 The water bath method helps custard bake gently and evenly. Without the hot water, the edges of the custard cook too quickly. Put the custard cups in the empty pan, put the pan in the oven, then carefully pour hot water into the pan. When the custards are done, remove the cups from the water or they will keep cooking.